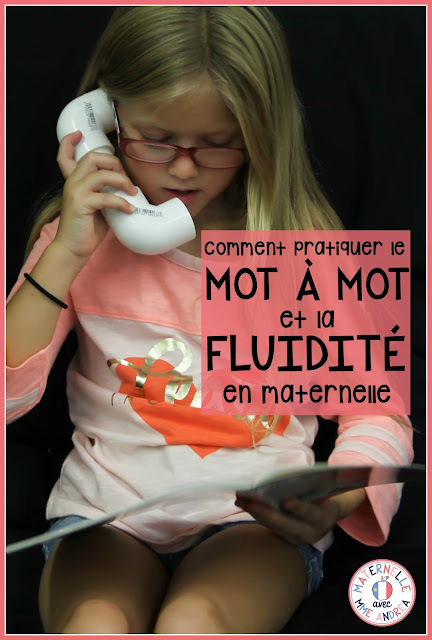 1:1 correspondence (correspondance mot à mot) and fluidity (la fluidité) are both very important skills that we need to develop in our students - even in our beginning readers! Both can be taught and explicitly practiced from the very start of their journey to learn to read, and can be taught and practiced in many fun and engaging ways. But before I share my favourite ways to teach and practice these skills, you may be wondering what I'm talking about! WHAT EXACTLY IS CORRESPONDANCE MOT À MOT? When a student has mastered 1:1 correspondence, this means that they understand that a word on the page = a word that you say when you are reading (either aloud or in your head). They have a solid grasp of the link between the text in books and the words that come from their mouth. You can tell that a student is mastering this skill when they are looking at the words on the page as they read (not at the sky!!!) and they are saying the correct amount of words. They also may notice when they make a mistake or when there is a new, unfamiliar word that they haven't seen before. If you ask them to point at each word or at a specific word when they read, they are able to do so. If a student has not yet developed this skill, you may see them memorizing texts and looking at you (or the sky!!!) as they "read," looking at the picture and saying anything that pops into their head, or not realizing if they have said too many or not enough words. And this isn't a bad thing! Being able to orally tell stories while looking at the pictures is a great pre-reading skill. There are lots of things that you can do to help your students take it to the next level! Reading with fluidity means that you read like you speak. A student who can read with fluidity reads with expression and intonation (that makes sense depending on the context of the story), and not like a robot. Even if they can't read new books yet, they can imitate the teacher's voice and intonation during shared or choral reading, and can recite known comptines or sing known songs with expression. 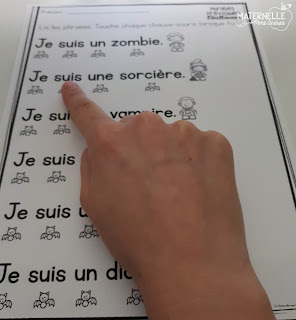 A student who does not read with fluidité may still need to point at every word (or they may sound like they are pointing at every word). If you "take their finger away," you may even see them bobbing their head or leaning their body to every word! They may sound robotic and uninteresting when they read. They may read too slowly and forget what they have already said or be unable to predict what comes next. Often, when students read without fluidity, it is an indication that they do not understand what they are reading. That's why it's so important! There are lots of ways to work on this skill, whether your students can really read words or not. I like to start practicing with my whole class from the beginning of the year, even before I put them in their guided reading groups. You can use lots of techniques to practice 1:1 correspondance - even counting in math class or reading music notes in music class! 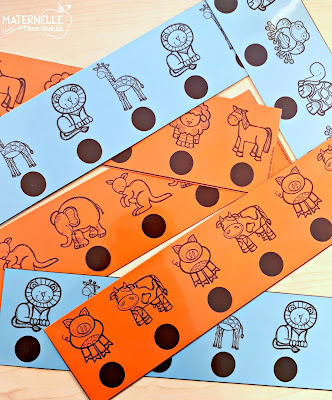 I like to use strips of paper with photos of animals on them and dots underneath each one, and then have my students put their pointer finger on each dot. Then they say the name of each animal they are pointing at, moving from left to right. You could use any kind of images you want - I usually pick animals because most of my students know them in French when they start in September, or soon after. After they have mastered 1:1 correspondance with the animal pictures, I may throw in a word or two on the strip along with a picture of an animal. Like "J'aime les chats," for example. I put a dot under each word and the picture. I find the transition easier for them to go from pictures to words and pictures than to words alone. It can freak them out a bit to come across a brand new word, even if there is a picture there, too! I make mini books with sentences like those, as well. These are the first books that I send home to parents in their reading bags to practice at home. I have another resource that has seasonal sentences with reading dots in both a "worksheet" format and a sentence strip format. I love adding the sentence strips to my students' reading bags to take home to practice! 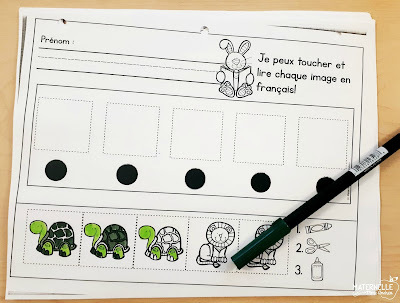 They are super simple and repetitive - great for our struggling readers! Here are some examples from the Halloween and Autumn sets, and I also have a Growing Bundle available in my store. You can also practice letter names and 1:1 correspondance at the same time. Games like speed reading where students roll a die and read the letters beside that number as fast as they can help force them to look carefully at every letter on the page. This game also works with sight words, vocabulary words, anything you like! 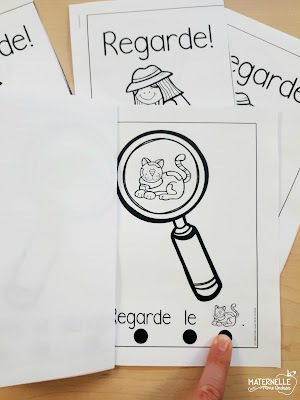 Lucy at For French Immersion is working on a special bundle of vocabulary speed reading with just images for kindergarten - check back here and I will let you know when it is finished! Another fun way to get students thinking about words in a sentence is by playing games orally. 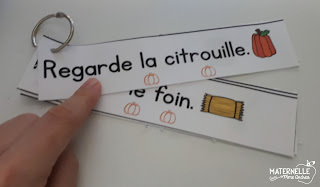 I say a sentence like "J'ai une balle rouge" and get my students to repeat the sentence, clapping once for each word and then counting the number of words. It can be hard for students to understand the difference between words and syllables (parts of words) at this age, especially if a word has a bunch of syllables. 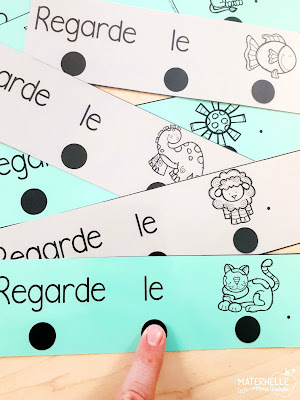 This game is a great way to practice and will help avoid students moving their fingers to a new word too soon when they are pointing to words in their books! Speaking of pointing to words in their books - be careful with this one! It's a strategy that can really work to help students avoid saying too many/too few words and to force them to look at the text while they are reading. However, once their 1:1 correspondance is solid, make sure to "take their finger away" and encourage them to "point with their eyes." 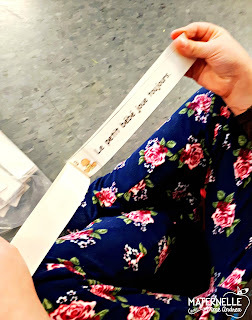 If our students continue pointing to the words in the book after they have developed 1:1 correspondence, it can affect their fluidité. I also love using special pointers. You can buy witch fingers at Michael's or the dollar store around Halloween each year, or little lights that they can put on the ends of their fingers. You can also make your own pointers with craft sticks and stickers or googly eyes. I like to use the special pointers when my students are pointing to words in "real" books, so that hopefully they won't use their actual finger by default once I take them away! My most favourite way to practice fluidité is orally through comptines et chansons, from the very first day of school! You want the default for your students to be reading and singing with expression from the very beginning. Encourage them to imitate your voice (and make sure you are reciting and singing with exaggerated expression, too!). The same goes for shared reading and big books! Another fun way to practice fluidité is by using fluency phrases. Yvette Rossignol has the best resource for this on TPT that I have seen so far. She has sentences written on strips that start small and then get longer and longer. The core of the sentence stays the same, but she adds more words each time. This helps students with fluency and with sight words! Just click on either of the pictures below to find them in her TPT store. You could also do a "book race" if you don't want to purchase or prep a new resource. For this activity, you just need your guided reading book and a thin strip of paper. After your student reads their book the first time, pick a page for them to practice (I like to do one easy page to warm up, and then a trickier page). You will take the strip of paper and cover the words from left to right as your student reads the page. The goal is for them to get to the end of the page before you. Make sure you are covering the words in the right direction so that you aren't blocking them as your student is trying to read! Speed is the name of the game here, rather than expression. By reading the page quickly during the race, when your student comes to that page while they are reading on their own, they should feel confident and naturally breeze through it. Finally, Toobaloos (whisper phones) are a great resource for students to use during read-to-self. They will be able to hear themselves and hopefully this will encourage them to not read like a robot. You could also get them to record themselves with a tape recorder or an iPad app and play it back. Encourage them to listen to see if they are sounding fluid or not! If not, let them try again. 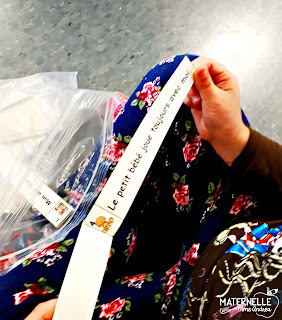 Les créations de Stéphanie has a great tutorial for making your own whisper phones (téléphones à secrets) if you don't have the budget for Toobaloos! As I'm sure you know by now, both of these skills are essential and need to be practiced, practiced, practiced in order for our students to become strong readers. The great thing about them is that they can be practiced whole group, small group, and one-on-one, all throughout the day! You can use books, games, songs, other fun resources and tools, or just your voices and your hands to squeeze that practice in. Once your students have mastered these skills, they will be well on their way to becoming confident readers who are a joy to listen to!